Colorful wrap-around design. 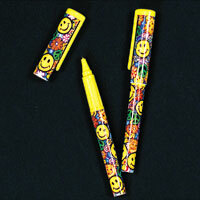 Plastic smiley face pens. 5 1/2 inch. (24 pieces per unit). $16.35 per pack for 6 packs or more. $14.55 per pack for 12 packs or more.